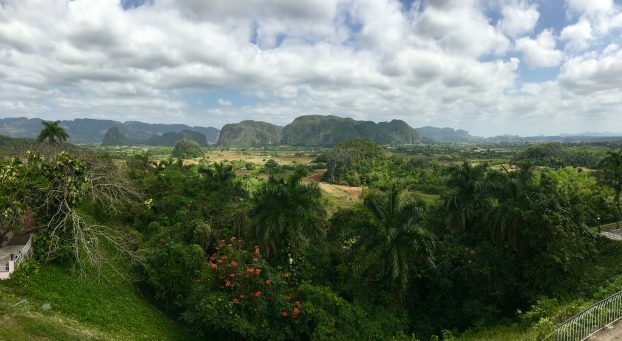 About 3 hours drive West from Havana, the Parque Nacional Viñales is just stunning – mountains, cliffs, and farmland forma stunning vistas. There is also the Gran Caverna de Santo Tomàs, the second largest cave system in North America, filled with stalagmites, stalagtites, and the ocassional bat. Finca Agroecologica El Paraiso is an organic farm with scenic views and delicious food. It is a large restaurant catering primarily to the tour buses parked in front. They load the table with more food than you can eat, and it is all quite good. 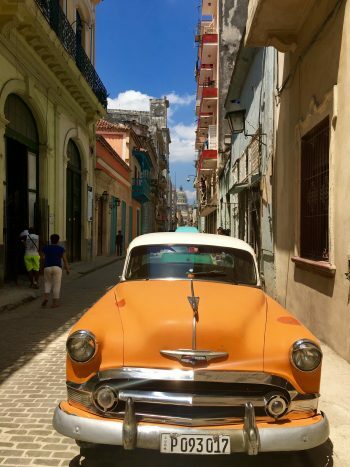 This region is also famous for tobacco farms and cigar factories. While we enjoyed our visit, we would have likely skipped it in the end as over 6 hours in a car our first day had great views but left us restless. I think better to go, stay in the town and do some hiking. 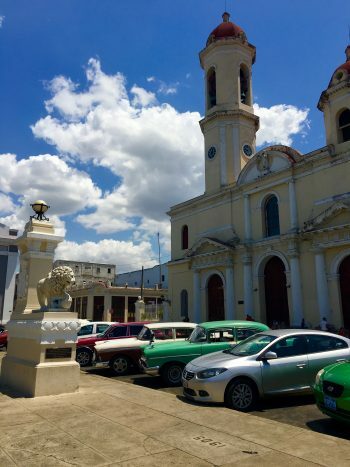 Matanzas is a nice small town about 60-90 minutes east of Havana. 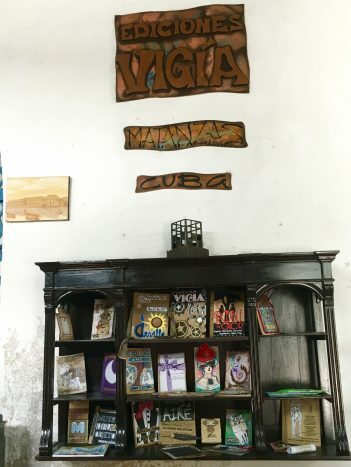 Our main purpose was to check out Ediciones Vigia. It is a workshop where they make quite creative first edition books, often poetry, that are works of art more than books. They only publish 200 copies of each book, and they are not expensive ($20-$50). I’d never seen anything like it. The central square of the town was also nice, and there was a performance art experience happening in front of a gallery, which was pretty cool. 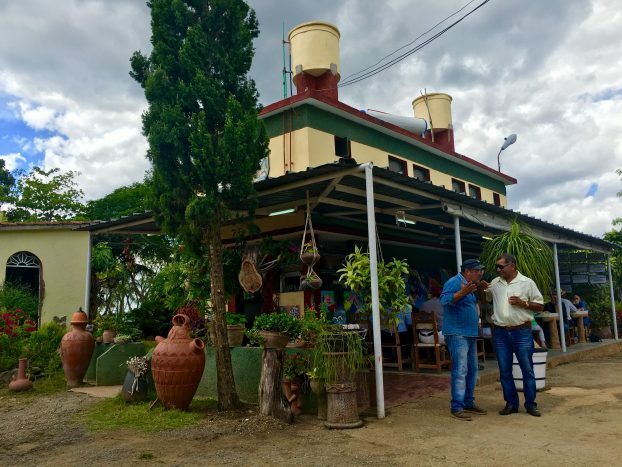 The highlight here was visiting Hector Correa’s farm, Finca La Coincidencia. This was one of our absolute trip highlights. The farm itself is very cool, and in his apiary, he allowed us to dip our fingers in the hives and taste the fresh honey and citrusy pollen which were quite declicious. 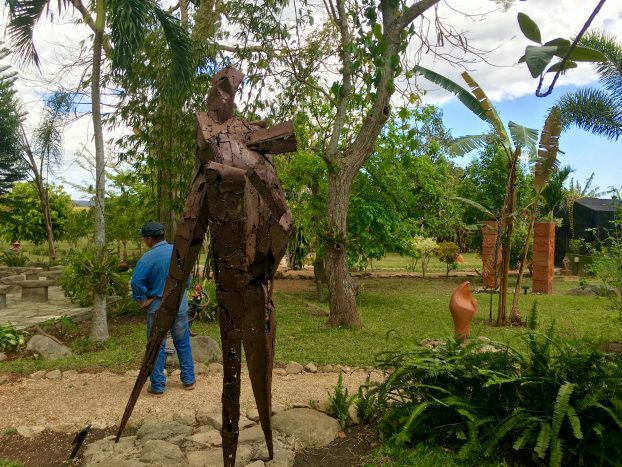 Among the guava trees, cashew trees, coffee trees, and plants, there were dozens of sculptures which were creative and alternatively poignant and whimsical. They have a pottery workshop and their pottery is quite affordable. Lunch at the farm was one of our best meals in Cuba. Hector was a charming and interesting host. After Matanzas we drove down toward Playa Larga. We visited Criadero de Crocodrilos to see the crocodile breeding program. 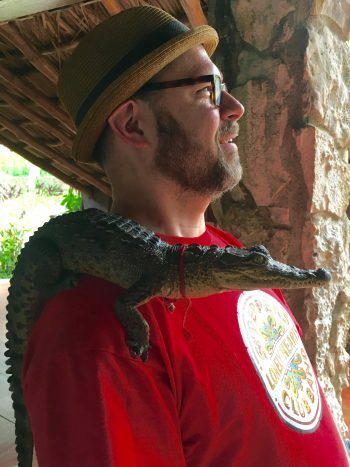 Our favorite part was probably holding and posing with a baby croc. There was some other cool vegetation in the park. The beach itself was not very special or nice. 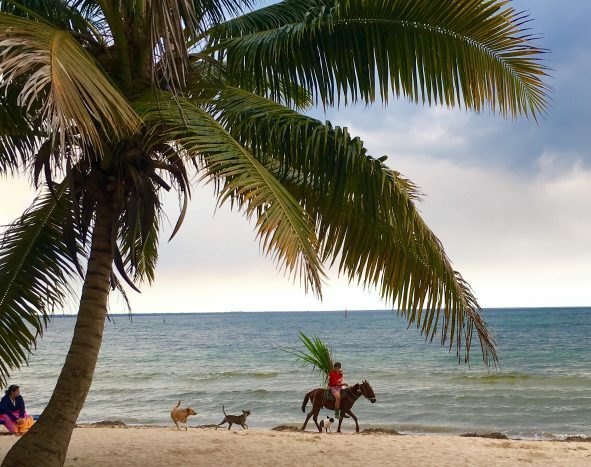 The water was a bit mucky but it was cool to see a kid riding his horse down the beach with some dogs following as they passed fisherman fishing with hand-thrown lines and no poles. This is one of the two beaches invaded during the 1961 Bay of Pigs fiasco. The Playa Girón museum about Bay of Pigs is closed so we skipped that beach. We were supposed to stay at Hotel Enrique, but the owner told us our room was not available because of a sick guest and they offered us a room in another inn that we were not crazy about. The owners were quite rude and we needed a different plan. Our amazing guide came to our rescue and found us a better room on the beach, Casa Zuleyda. Our room was facing the water and I enjoyed eating grilled lobster on the beach. The band that played in our little restaurant on the beach was quite nice and even let me jam with them a bit. This is a town with a lot of culture and a UNESCO world heritage site. Lots of cool architecture and a nice city to just wander around which we did. 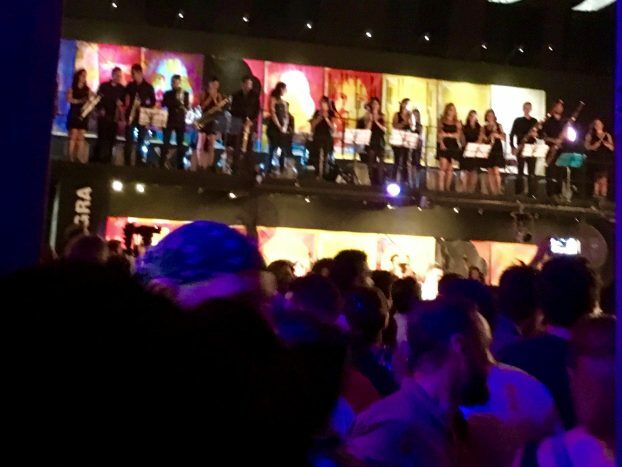 One highlight is the cool old Teatro Tomàs Terry and the opulent Palacio de Valle, a 1917 mansion that is now a restaurant and rooftop bar with views of the harbor. We had two great meals in Cienfuegos at Paladar Aché for simple but well prepared lunch in a unique setting with caged birds and Cuban music videos. 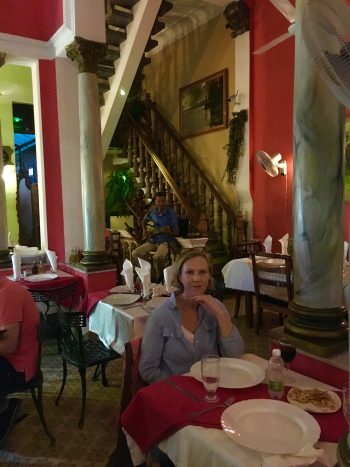 For dinner, we loved Doña Nora – the food, the charming ambiance, and a great guitarist and singer. Recommend reservations, especially at Doña Nora which was quite busy. 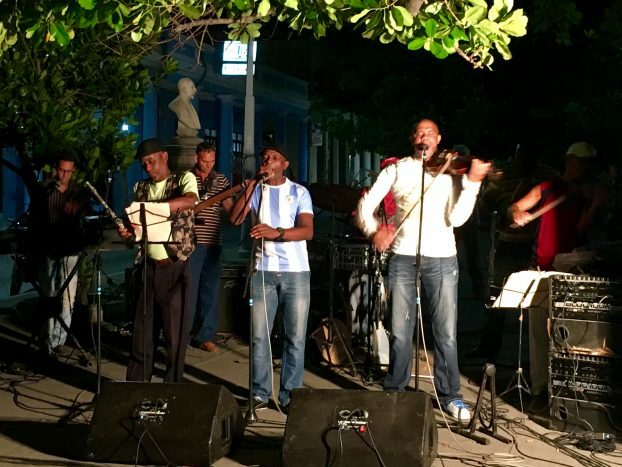 Cienfuegos is a cultural city and we heard great music outside near the statue of the legendary singer Benny Moré and at La Union hotel. The hotel is quite nice and it boasts a beautiful and relaxing pool area as well as a great rooftop bar with great music at night. 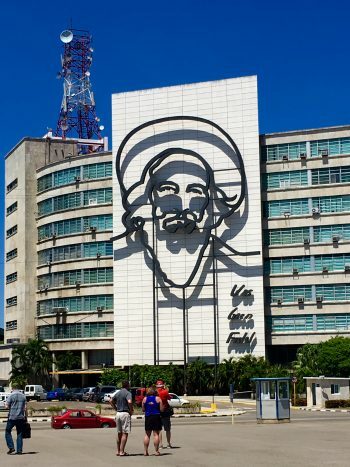 We only scratched the surface of La Habana. 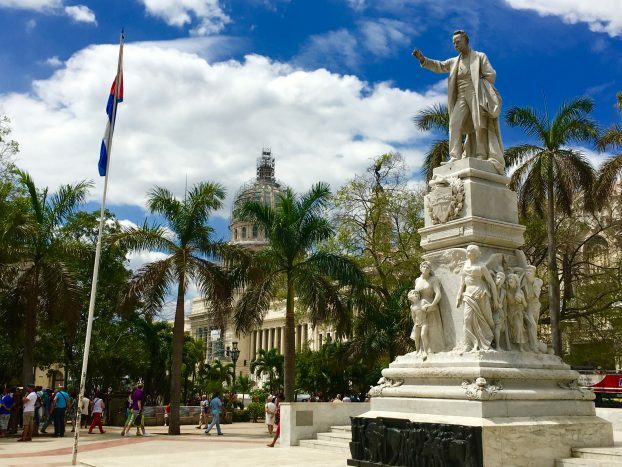 We had a 3 hour walking tour of the old city, Habana Vieja, and its four plazas. There are a lot of galleries, shops, museums (the museum of chocolate was intriguing but really just a shop) to explore. We spent a second day wandering an wish we had more. Driving the Malecòn, the road along the ocean is nice, and people gather at night to check it out. The Parque Histórico Militar Morro-Cabaña is fun to visit after you drive through a tunnel to the little island, and we had a driving tour of the Miramar district and a nearby wooded park with lots of hanging vines that was fun to explore. 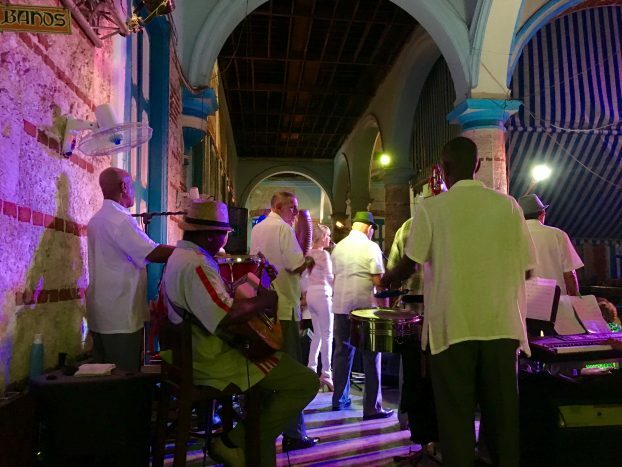 We stopped for drinks overlooking the ocean at the historic Hotel Nacional and recommend the same. Facbrica de Artes is an amazing place. It reminded me in ways of Tacheles in Berlin and MASS MOCA in Massachusetts. It is an old factory transformed into an arts center. 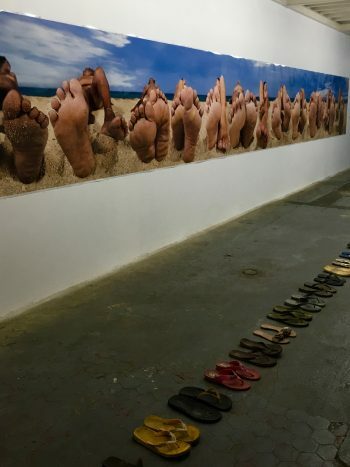 There was a performance of Ravel’s Bolero by a young symphony playing to a very young audience in one gallery, an incredible contemporary collaborative photography/painting exhibit by Carlos Quintana and Enrique Rottenberg, and other galleries with visual and performance art. It costs $2 to get in and there are multiple bars and a nice shop. 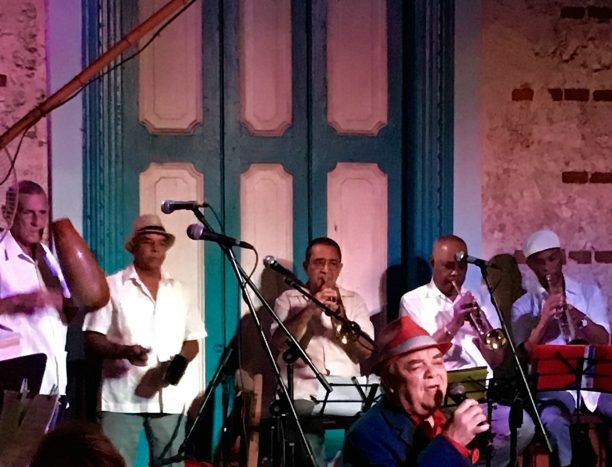 We found music in many places, but paid $30 for a “Buena Vista Social Club” performance at Sociedad Cultural Rosalia de Castro and was a little disappointed. We bought tickets early because we were told it sells out and arrived early only to be seated in the literal back corner of the giant room which has a large open atrium in the middle. We asked why we were put there and were told that if you order dinner with the ticket there are seats closer but otherwise the giant tables are for tour groups. Over a dozen singers took turns and each walks throughout the hall, but it was hard to enjoy from the distance behind hundreds of other tourists who were not all engaged with the music. We stood up and moved toward the front and stood in front of a pillar which made it better, but it felt a little too tourist-directed and we liked many of the other performances we caught during our trip. 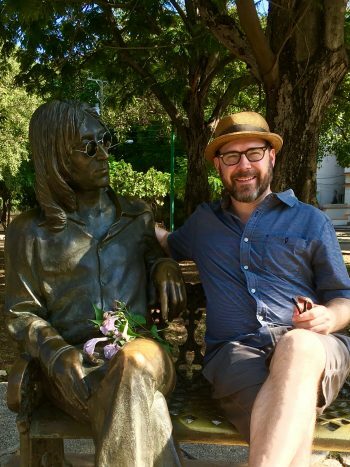 We stayed at a “Casa Particular” (a meticulous private home bed and breakfast with kind and generous host) in Vedado which was nice to walk around – we were able to walk to the huge and cool old cemetery as well as to John Lennon Park and the Malecon, which we walked to. 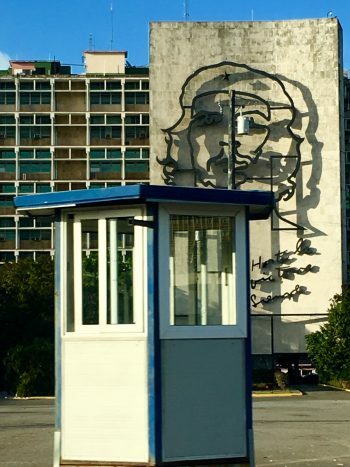 The Plaza de Revolucion was nearby as well. Get your reservations for dinner if you are dining at nicer restaurants in advance of your trip – there are very few and they are in demand. 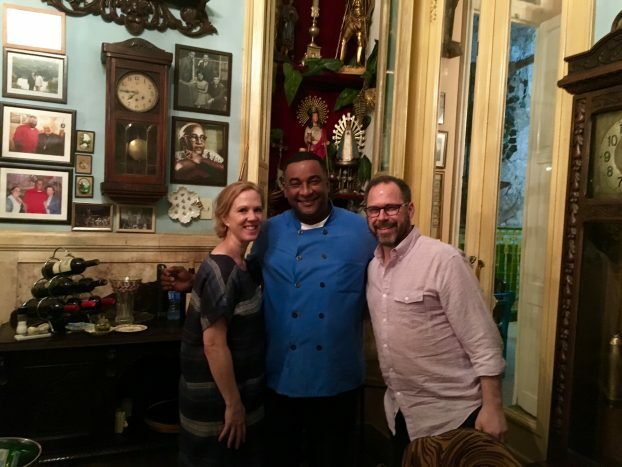 We had a few amazing meals in Havana and one crappy Cubano (with ketchup?!). We learned about San Cristòbal Paladar when President Obama dined there. 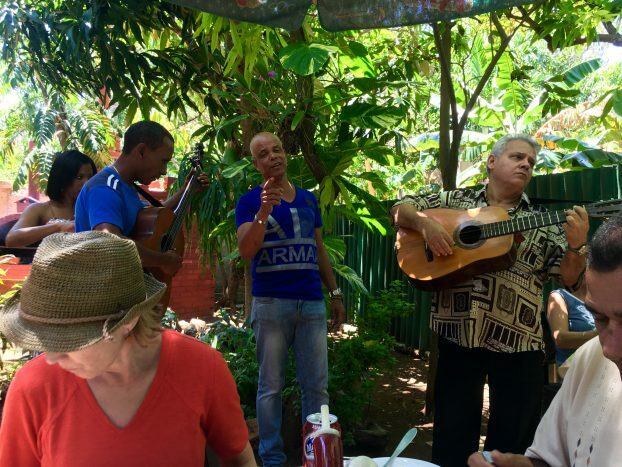 The atmosphere is just incredible and the Afro-Cuban food really delicious. The staff were still buzzing about the President’s visit, and the service and ambiance were as first rate as the food. The décor is filled with antiques, old photos, record covers, and other items that gives it a classic look even though it has been open only about 5 years (it is in the owner’s home). Since it was my first night in Cuba, I dove into the Ropa Vieja after a delicious appetizer sampler and loved it. Otramanera started us with the best ceviche I’ve ever had, and kept raising the bar after that. We had a green papaya salad, pork loin and a delicious Cuban curried fish and finished of with molten chocolate cake and Tocinillo de Cielo. Every dish was beautifully presented and absolutely delicious. The dining room is open to the outdoors, the design is very modern, and the service is very professional and diligent. Paladar Doña Carmela near the Parque Històrico Militar was simple but delicious food and beautiful music during our lunch. We also had a quick lunch at Café Bohemia in the old city, which had a Mediterranean theme and very casual. We sat outside where a group of children were visiting to play with toys and games set up there which was fun. We planned our trip before People to People rules opened up more. We did not want to be with a tour group, and sought out an agent who could arrange for us to travel ourselves with a guide. Michael Lo Presti from the Puerto Rican office of Vamanos Tours was a great partner and really planned an excellent experience. 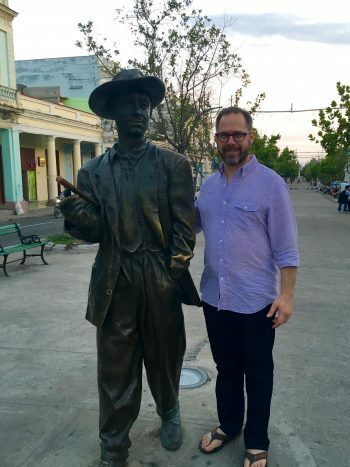 He arranged our lodgings, our dinner with families outside Havana, our visit to Hector’s farm, and the rest of our itinerary. He knew we wanted to stand clear of tour groups and did a good job of making sure we saw the popular sites and had some experiences outside of that. He joined us for the first few days of our stay. I would recommend him/them for helping set up a trip. Our driver and guide, Jose Angel Cobas, I cannot recommend enough. His English was excellent, he seemed to know everyone wherever we went, he taught us so much, he helped us solve problems with no stress, and he was a delightful traveling companion.